Well, I might not have managed to get to Spoonfest this year, but I did manage to bag myself a new Robin Wood spoon knife. He had made some before and they had sold out very quickly so when he mentioned in a recent post that he would be selling another batch at Spoonfest, I gave Ju instructions to try and get me one. And he did. It cost £15, which I thought fairly reasoable - in fact the same price as a Dave Budd hook which I know happen to be really good knives - I look forward to seeing how Robin's Sheffield steel knives compare. I picked it up from Ju's today - it seems ok, albeit a little irregular, but that wont necessarily adversely affect the performance. Julian had also traced around one of Robin's handles (he was selling the blades pre-handled for £30, which seems a bit steep to me, but then I didn't have to put in the time and effort to handle them) so I thought I'd have a go at doing one similar, I think out of cedar, but I'm not entirely sure. I also made my handle just a fraction longer than Robin's in the hope of being able to use the leverage of the longer handle. It looks pretty good - I'll give it a whirl tomorrow and see how it does. I was also chatting with Ju yesterday about the use of stop-cuts in spoon making. 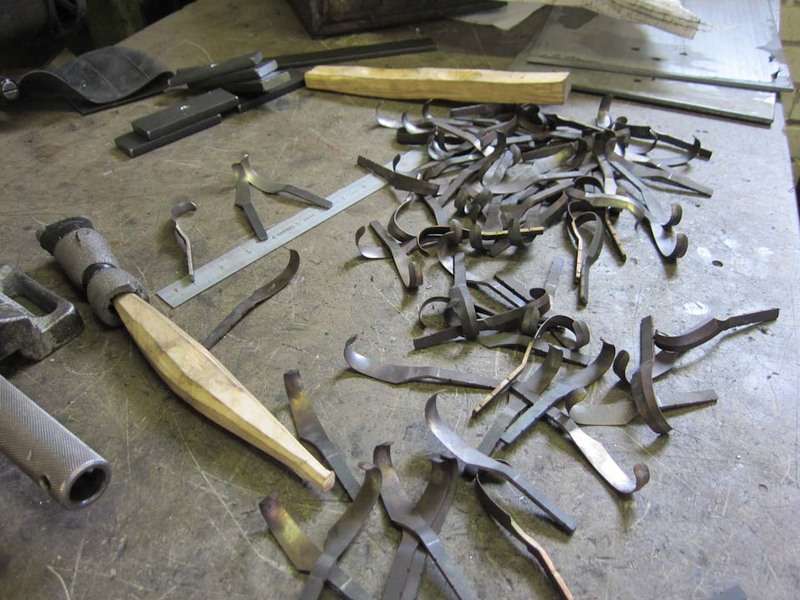 When I first started making spoons I always used stop-cuts where the handle meets the spoon in order to prevent over-zealous axe work when trimming the handle from over-shooting into the bowl. As my axe work got better and more accurate, however, I stopped. Until, that is, Jarrod Stonedahl's recent carving video which reminded me that it doesn't make me a better carver if I don't use stop-cuts and that it actually makes my carving more safe and efficient if I do, so now I do. Then I got to thinking, wouldn't a stop-cut help to solve the over-shooting problem I sometimes have when cranking a spoon? So I thought I'd give it a go and see how it worked out. Two spoon blanks with stop-cuts at the shoulders and across the bowl for the crank. A side veiw to show the depth of the stop cut. All in all I would say that for the sake of a 30 second cut with my folding saw, it was actually worth the effort and made the profile cuts just that little easier. It's really an amazing knife.I always like to share these type of blogs for making things. Thanks for sharing with us great blog.